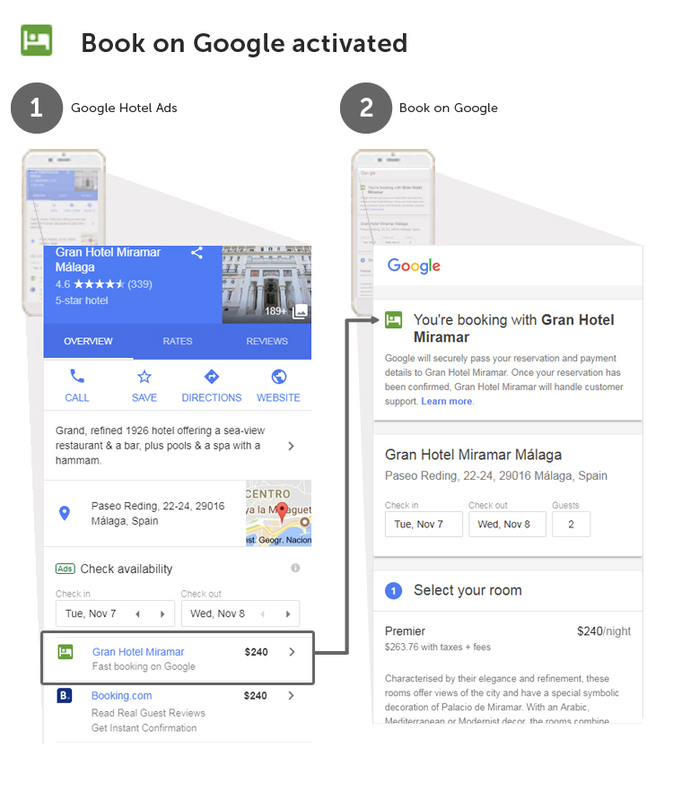 Google is making giant leaps expanding its product Google Hotel Ads with a new function added a few months ago called “Book on Google” (BoG), also known as Easy Booking. Although at first its use was limited almost exclusively to OTAs and some global partners, at Mirai we prioritise the incorporation of Book on Google through Peakwork and, after months of work, we are proud to be the first partners to achieve it and put it at our clients’ disposal. (September 2018 update: We are integrated with Room Booking Module on Google Hotel Ads so that the room photos are shown on the Book on Google booking process, thus providing a much more user-friendly experience). Below, we are going to take a look at everything you need to know to gain a better understanding of Book on Google. It is a booking system or interface which Google provides so that the client makes the booking without leaving Google instead of redirecting the user to the hotel or OTA website. When the user searches for a hotel on Google, whether it’s in the search bar or on Google Maps or Google Destinations, they will come across the prices of the channels bidding on Google Hotel Ads (OTAs and hotels directly). If Book on Google IS NOT activated: When users clicks on a price (the OTA’s or the hotel’s direct channel), they will leave Google and continue the process on the OTA or hotel website. 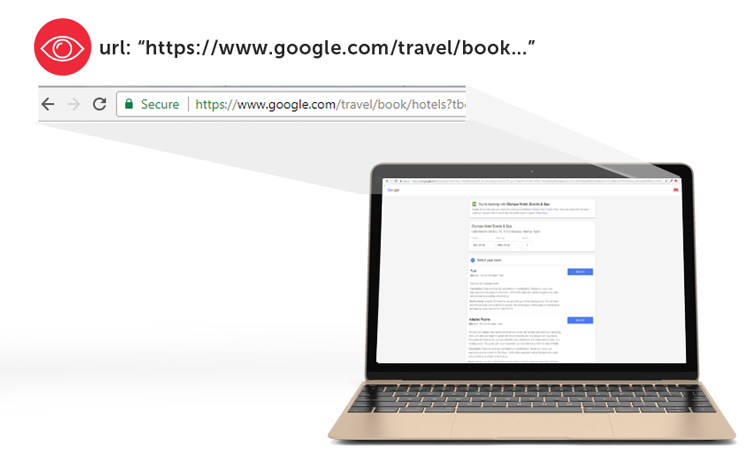 If Book on Google IS activated: When users clicks on a price, Google will connect to the prices of the website behind said price (the OTA’s or the hotel’s website) and the user will continue their booking process in a booking system without leaving Google. Book on Google is, therefore, an optional tool to Google Hotel Ads but it is mandatory to sign up for Google Hotel Ads (whether it’s in a CPC or commission model) in order to have Book on Google. You can find out more information on how Book on Google works in this post. Which is the objective of Book on Google? According to Google, Book on Google will improve the user experience, particularly on mobile devices (where there is friction when the user has to go from one website to the other). Therefore, conversion will increase and, consequently, so will profitability for the hotel. Also, Google and Google Wallet users will not have to introduce personal and credit card data respectively, thus particularly improving their user experience. In which markets is it available? Any hotel in the world can now hire the services of Book on Google. However, at this time, use of Book on Google is currently restricted to markets in the United States and the United Kingdom. Only users from these countries, identified by point of sale, in other words Google.com and Google.co.uk, can see the Book on Google option. Users from the remainder of countries will have to wait until Google launches it worldwide although we estimate that it will be available in all countries in 2018. Google is carrying out a gradual launch just like TripAdvisor did with Instant Booking. How can I sign up for Book on Google? You need a metasearch engine connection partner integrated with Google Hotel Ads and the Book on Google function. As of today, Mirai complies with both requirements. How much does Book on Google cost? 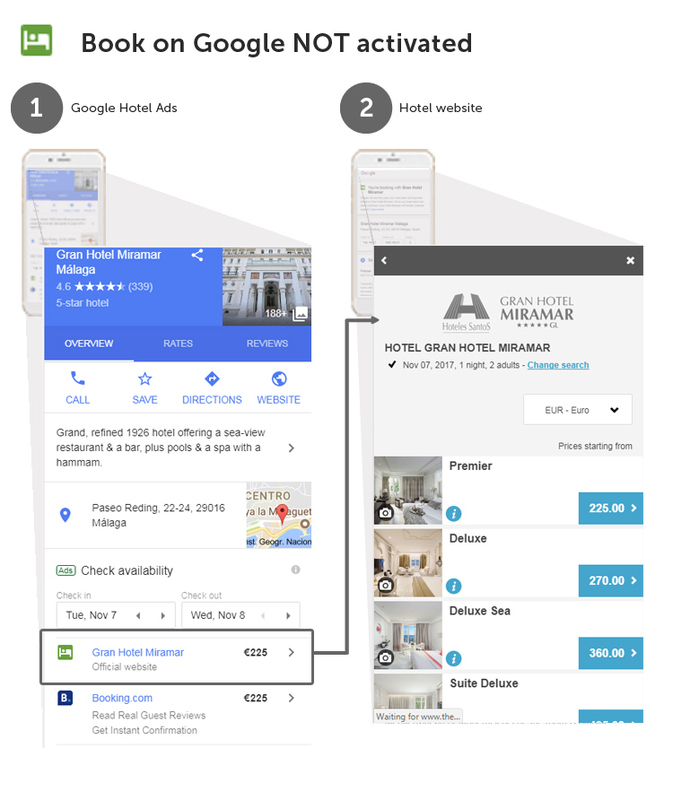 Google does not charge an additional fee to the existing one from Google Hotel Ads for bookings made through Book on Google. The cost will be the same CPC (cost per click) or CPA (commission) that you pay for each booking made through Google Hotel Ads. However, up until now, Google only allows the integration with Book on Google through two intermediary platforms (third-party companies), which do have a service charge. If there is a charge, the amount will be decided by your integration partner, so you will have to check with them. Should I sign up for it? If you already use Google Hotel Ads, we recommend that you try it and subsequently work out the numbers. In a reasonable period of time you will be able to see if your conversion and, therefore, profitability have improved. If you don’t currently use Google Hotel Ads, remember that the OTAs will be the ones capturing all sales generated through this channel until you decide to sign up for it. I don’t love the idea that sales are not taking place on my website but I’m aware that my sales suffer on mobile devices in comparison to OTAs. Can I activate Book on Google only on mobile devices but not on desktop bookings? Yes, you can, and this is undoubtedly one of the greatest advantages that Google offers in comparison to other solutions. Conversion on mobile devices is always lower than on desktop devices (there are many reasons which justify this) but it is also true that it is one of the main weapons of OTAs who are competing against direct channels, since it helps redirect sales to them. If an interface like Book on Google allows us improve user experience on mobile devices and, therefore, conversion, this is fantastic news. If a user books on Book on Google, is it a direct sale or is it practically like selling via an OTA? This is the eternal debate which began with the irruption of the functions of TripAdvisor’s Instant Booking first, then trivago’s Express Booking and now Book on Google. All of them, despite being different to each other, have something in common which is that the booking is carried out in the metasearch engine, thus conceptually distancing itself from a “direct sale” per se and standing in a new grey area called “semi-direct” or “semi-intermediated” sales. Book on Google, TripAdvisor Instant Booking, trivago Express Booking, CPC or CPA, direct or intermediated sale… Isn’t this getting a bit complicated? Yes, it is. Metasearch engines have not stopped evolving since their inception and it is rare for them not to mutate every few months, offering new services to its users and new functions to hotels in their direct integrations. What at first seemed nice and friendly is now becoming difficult to understand and staying up to date is a learning yet also technological challenge in constant evolution. In any case, the one thing that doesn’t change is that, in the end, it is all about sales profits. Everything which reduces your distribution costs (and there is still a lot of room for improvement in the regular 20-22% that OTAs charge you) must be taken into consideration. The metasearch world is undoubtedly one of these pillars. Debates aside, the large price-comparison sites have a propensity towards providing more services to its users and it is fundamental for hotels to know about all the details, carrying out trials and making the best decisions at all times. However, if they remain passive towards all of these changes, their direct-channel sales will constantly decrease and OTAs will increasingly capture sales share, which will therefore increase distributions costs in the long term. Hi Ron, sure you can get this in the USA. Just need to look for Google Hotel Ads partners with Book on Google support. So this way you also avoid Commission to you booking engine. But this will be tracked in Google analytics?